Rome attraction-guides.com - Rome, Italy attractions guide Rome Colosseum (Colosseo) information about attractions, open hours, admission charges, history, construction, Emperor Vespasian, gladiator combats, marble and plaster mouldings, statue of Nero, landmark ruins, location and address, tel / telephone number, general tourist information about Colosseum (Colosseo) in Rome (Roma) area, Italy (Italia) IT - Last updated 30/10/2012. 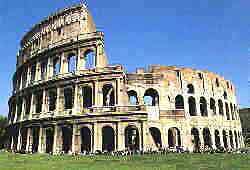 Rome's world-famous Colosseum (Colosseo) was commissioned in 72 AD by Emperor Vespasian. The Colosseum (Colosseo) is a truly majestic ancient ruin and one of Rome's most impressive monuments. The Rome Colosseum (Colosseo) has hosted many games and events for more than 100 years and could hold over 50,000 spectators. Popular events at Rome's Colosseum (Colosseo) included deadly gladiator combats, wild animal fights and fast chariot races. Before fighting, gladiators would always salute the Roman emperor and shout 'Ave, imperator, morituri te salutant', which translates as 'Hail, emperor, men soon to die salute you'. Rome's Colosseum (Colosseo) was constructed in just eight years by the Roman emperor Vespasian and was finished by his son Titus in 80 AD. Originally faced with marble and intricate plaster mouldings, the Colosseum also had large awnings to provide shade from Rome's hot sun. The Colosseum (Colosseo) is named after a huge 73-metre / 240-foot statue of Nero that stood nearby at the entrance of the Golden House. In 1312, Henry VII gave Rome's Colosseum (Colosseo) to the Senate and the Roman people, and it was not long before it sadly became a quarry, with enormous blocks of travertine stone taken to build Rome's Palazzo Venezia (Venezia Palace). Pope Benedict XIV soon ordered that the ruins became a sacred place in memory of all the blood that had been shed there. Today, Rome's Colosseum (Colosseo) is probably the most breathtaking landmark that remains of ancient Rome.